About 22 kms from Bharatpur is this vast complex, built during the second half of the 16th century by the Emperor Akbar. 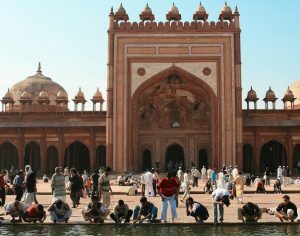 Fatehpur Sikri (the City of Victory) was the capital of the Mughal Empire for only some 10 years. Fatehpur Sikri, popular among tourists and archaeologists, is one of the World Heritage Site in India. Major monuments of Fatehpur Sikri holds number of architectural treasures that slowly unfold in front of you. What you can see is magnificent ruins of the bygone era; some are in excellent state of preservation.